In 1955, Kreisler returned to Europe where he spent three years in his native Vienna before moving to Munich. In the mid-70s, he moved to Berlin then Salzburg and Basel. 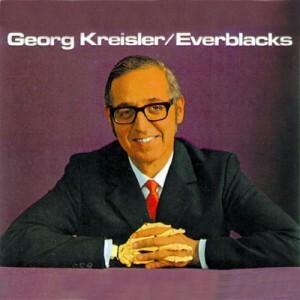 Kreisler’s songs are black humor and biting social commentary at their best. They are wonderfully wicked, hair-raisingly politically incorrect and sometimes downright bizarre. 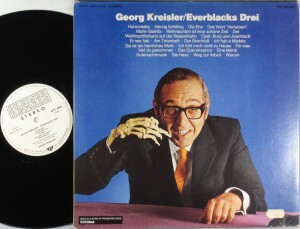 The titles of some of his most well-known songs include Tauben Vergiften Im Park (Poisoning Pigeons In The Park), Zwei Alte Tanten Tanzen Tango (Two Old Biddies Dance The Tango), Das Mädchen Mit Den Drei Blauen Augen (The Girl With The Three Blue Eyes) and Wir Sind Alle Terroris ten (We Are All Terrorists). For many cabarettists, music comes second. In general, it’s not that important if they can actually sing. But Kreisler’s golden bass baritone, which brilliantly contrasts the actual texts, is pleasant to listen to even if you don’t speak German. Below, I’ve translated a section of two of his songs: the dark and strange Als Der Zirkus Im Flammen Stand and Zu Leise Für Mich, which teeters between wistfulness and indifference. To give you a better feel for the cleverness of the language, I’ve translated both texts very loosely (i.e., more for meaning rather than literally word for word). More animals are burned to a crisp and a couple of murdered children are thrown into the mix later in the song – all very dark and surreal. To see the original German text, click here. But I can never hear it…..
Click here for the German text.